In early May I drove up to Nebraska for the weekend to see some family and, as I often do when I’m traveling alone (as opposed to with my wife and kids) I took a slightly longer but vastly more scenic route compared to the interstates and freeways. I cut through Kansas on Highway 15 instead of I-35 and I-135 and in the process managed to see some interesting sights in the Flint Hills that make long drives like this a little more enjoyable. There’s a judgement call to make whenever passing something that might be worth a photo, though: is it worth my time to stop and try to get what might be a good picture, or should I press on towards my destination knowing that each stop along the way gets me there just a little bit later? I believe I got this shot near Abeline, Kansas, though I can’t remember if it was north or south of the town. The sun was setting and I knew I would be losing all daylight soon, and even though I had stopped to get a windmill photo about an hour before this one I thought I might as well give this a try just for kicks. I pulled over, grabbed my X100F, and sat down as close to a barbed-wire fence as was humanly possible in order to reach my hands through it and get a decent shot of the windmill. I dared not cross the fence on to private property, but I hope that just reaching across wouldn’t count as tresspassing! 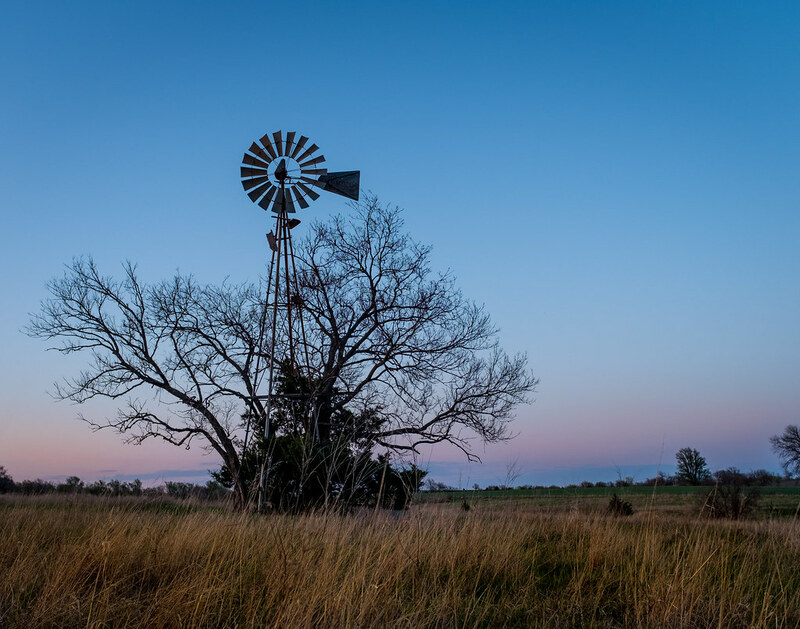 I shot this from a low angle to give a sense of presence and authority to the windmill, and purposely put it on the left side to help the viewer see the wide expanse of grass and sky on the right. Highway 15, along with some overhead power lines, are just outside the frame on the left side and while I wish I could have mowed down some of the pesky grass sticking up from the bottom third of the image I figure it’s all part and parcel of living in the midwest so might as well just embrace it. My dad found the exact windmill after a lot of searching on Google Earth. Thanks Dad! Nice shot, Simon. Windmills are a dying breed and it’s always nice when you see one, reminding us all of simpler times. A while ago I knew I was going to be driving through Kansas so I posted online asking for places to get shots of windmills. Everyone was saying that there’s none left, and asking why I was bothering to even try! I responded to a couple of people that there were windmills all over the place along Interstate 35, but I was quickly corrected. Those aren’t windmills…they’re wind turbines! Actual windmills are, as it turns out, few and far between these days. Love this photo. So well done. Nicely captured. Thank you for the explanation. Very nice! Reminds me of our missing 9-mile prairie picture! Thank you! That’s a very nice compliment!